The visit to Marco De Bartoli's cellars was the highpoint of a press trip I took to Sicily a few years ago, and I can still taste the wines now if I think about it. Alas, much has happened since then, and Marco has left us (Giulia remembers him beautifully), but I was happy to find his son Sebastiano pouring the wines he and his father made at Vin Nature this spring. This is fortified; it's tawny amber with white rim, and has an elegant bouquet with rich sweetness mingled with walnut skins and hints of dark brown sugar, vegetal accents, considerable alcohol, and warmth. Great depth. On the palate it's rich, with powerful savory walnut skins and warmth that flow into a long warm walnut skin finish. Terrific elegance and complexity, and will be beautiful far from the table. It's one of those wines that make you forget all else and talk to your glass. Despite its high alcohol content, this is not fortified. Just the grapes. Pale tawny amber. The bouquet is rich, with some walnut skins and hints of bitter honey and alcohol supported by spice and savory accents; one could go on but it displays a harmony that is simply extraordinary; the stuff of gods and one could sniff for hours. On the palate it's bright and rich, with clean powerful minerality laced with sea salt and warmth and walnut skins and vegetal hints, with hints of sweetness -- the alcohol -- that take the edge from the dryness of the walnut skins, and it goes on and on. Beautiful, and a wine you simply won't forget. Tawny amber with white rim. The bouquet is rich, with hints of dark brown sugar supported by alcohol and some walnut skins, and deft dried orange peel, almonds, some cedar, caramel, and more: rare harmony. Extremely pleasant to sniff. On the palate it's rich, and fairly sweet, with elegant minerality and sea salt -- one can taste the region's salt pans -- supported by brown sugar and walnut skins that flow into a long clean walnut skin finish with dried orange peel acidity and lasting warmth that slowly fades into savory accents. An extraordinary tour de force, and the real regret I have in drinking it is that I couldn't wait a few more years, because it will be eternal, gaining layer upon layer of complexity as the decades pass. More about Marsala, one of Italy's greatest wines. I sat, now like then, in the same spot in the same room, next to the same fireplace. And it was Christmas, like now. Just a long, long time ago. It was winter and our big country home was cold; I was wearing a hand-knitted brown sweater, with the collar turned up like a shirt. The cut for a teenager. I was reading a book, or rather a tome, with a rough yellow cardboard cover, and couldn't put it down. And couldn't keep my mouth from watering due to the combination of the aromas wafting in from the kitchen and the superb dishes described in the book. And thus, every now and then I'd take a break and look through the pictures on the cards in a pocket in the dust jacket: Recipes, with photos of elaborate (or so they seemed to me) French dishes. They looked mouthwatering. Refined. Elaborate. Glistening. 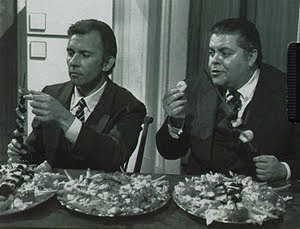 The same dishes that appeared in the book, of course. Cooked by Fritz Brenner and devoured, obviously, by Nero Wolfe. 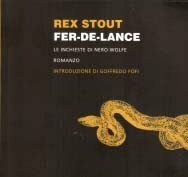 The book marked the beginning of my unending devotion to the character invented by Rex Stout. 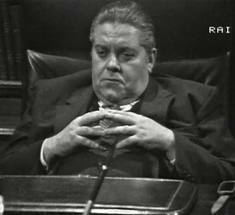 A character who had already captured my imagination a few years previously thanks to the extraordinary performances of Tino Buazzelli and Paolo Ferrari, i.e. Archie Goodwin. But the real spark came for me thanks to that tome, which was revolutionary at the time, a "practical gastrothriller" that didn't just make one imagine, but also gave one the illusion of feeling, tasting, and being in "the old brownstone" on 918 35th Street in Manhattan. At the time I still had in mind the "Haute Cuisine" of the Woolfe episode on TV, with its campy moog sound effects, shiny 70s crystal, the squeaky soles, and the low ceilinged carpeted velvet laden rooms laced with the aromas of the Midnight Sausages, prepared following a secret recipe. 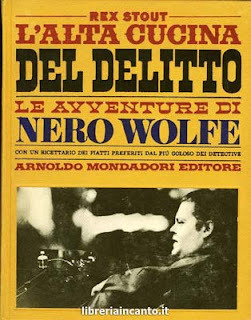 A quick search online and here we have it, "Alta Cucina del Delitto," published by Mondadori in 1969 -- 891 pages. I said it was a tome, and within its covers were Fer-De-Lance, The Red Box, Too Many Cooks (we're speaking of...), Over My Dead Body, and Where There's a Will. Now it's available in almost-new condition -- Zounds! -- in the used sections of web bookshops. But, warns my honest bookseller, "without the recipe cards in the jacket pocket." Which my copy has, because I of course still have it. Take that! Like a river in flood this all came back to me when the mailman brought me the new Beat Edizioni paperback edition of Fer-De-Lance, the first story in the Mondadorian volume, and the first tale (1934) in Nero Wolfe's long saga, now reissued in an inexpensive paperback edition (9 euros) by the Venetian publisher. An exciting tale of suspense, like all of Stout's stories. Which immediately reveals the hedonistic facets and twists destined to accompany the protagonist throughout his more-than-half-century career: cold, foaming beer to stimulate reflection, and food as an essential catalyst for every activity, which brings together civility and pleasure, and thought and knowledge of life. His investigations? Lucrative, necessary parentheses between one course and the next. Chop the onion and the garlic and sauté them in the goose fat until translucently gold. Sprinkle the brandy over them, and then the broth and the red wine. Add a pinch each powdered thyme and rosemary, and hints of nutmeg and cloves. Simmer over a gentle flame for 10 minutes, and add enough breadcrumbs to make a paste. Cook another 5 minutes, stirring. Add the chopped meats, beginning with the bacon, season with salt and a generous dusting of pepper, add the pistachios, and simmer until the mixture has the consistency of fresh sausage meat. Fill the sausage casings with the mixture, giving the casing a twist every now and again to form links, and tying them with twine. Run them under the broiler, after puncturing the skins here and there. When we went to Piemonte to taste Barolo and Barbaresco this fall we were hosted by Fontanafredda, which is perhaps Piemonte's most historic winery: In the mid-1800s King Vittorio Emanuele II, who found the rigid etiquette at Court stifling, was want to sneak out of town whenever he could to hunt, enjoy fine foods in friendly surroundings, or to see Rosa Vercellana, the fetching daughter of one of his soldiers. Though he had a reputation as a ladies' man the relationship was serious; he built her a home on a hundred-hectare hunting preserve not far from Serralunga d'Alba, and following the death of his queen made her Contessa di Mirafiori and married her. Since she had started out a commoner the marriage was morganatic; this meant that upon the King's death their children didn't have access to the Royal treasury, and to guarantee Count Emilio Guerrieri's future Vittorio Emanuele willed him the estate that had been Contessa Rosa's home. A hunting preserve, beautiful as it may be, doesn't offer much of an income. However, in nearby Grinzane Cavour the vineyards below the castle were producing wonderful wines, and Marchesa Falletti, who lived a few miles in the other direction, was gathering the Nebbiolo-based wines that had been known by their vineyards -- Cannubi, Bussia, Sarmassa and so on -- under a single glorious heading: Barolo. Conte Guerrieri cleared his land, planted vineyards, and in 1878 founded Mirafiori Vini Italiani. Having done this he had a problem: A hundred hectares of vineyards require considerable manpower to maintain properly -- not just during the harvest, but during the rest of the year as well. Mirafiori, while beautifully positioned for making wine, was several hours' walk from the nearest town, over roads that would turn to mud during the wet seasons. So he built a town for his workers -- a fully functional village, with general store, school, and church. 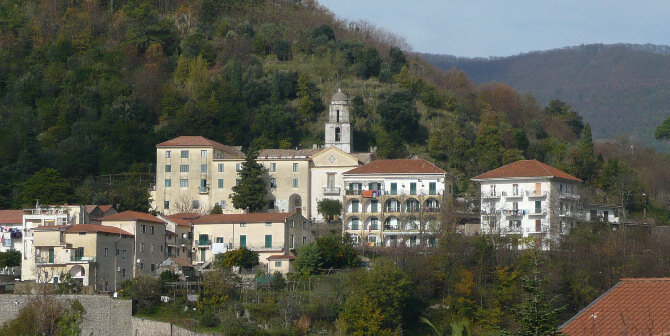 Though company towns were fairly common in other industries (especially in the United States), this is the only Italian winery built following 19th century industrial precepts. Taken as a whole, what Count Guerrieri built resembles other 19th century factory complexes, for example the textile mills one finds along rivers in New England, but with a couple of twists. Rather than have plain brick or stone facing, he chose to paint the plaster with red and gold stripes, the colors of the House of Savoy, and added decorative elements in silver and blue, his family colors, under the eves -- a clever way to remind people of his roots, and one which is especially beautiful in the light of the setting sun. What really sets the complex apart, however, is the setting: Nestled in a valley, with vineyards draping the slopes, and a pretty park in the flatland surrounding Contessa Rosa's house. Nothing like this in New England, and it's well worth a visit if you are in the area. Any illusions you might have about being in a traditional factory vanish upon entering the cellars, however, as you behold hall upon hall of botti, the huge traditional oaken casks where Barolo and other wines quietly mature. The winery was extremely successful, and would probably still be Mirafiori Vini Italiani today had the Count's son not gone into politics -- while he was busy with affairs of state the winery languished, and in 1931 went bankrupt. 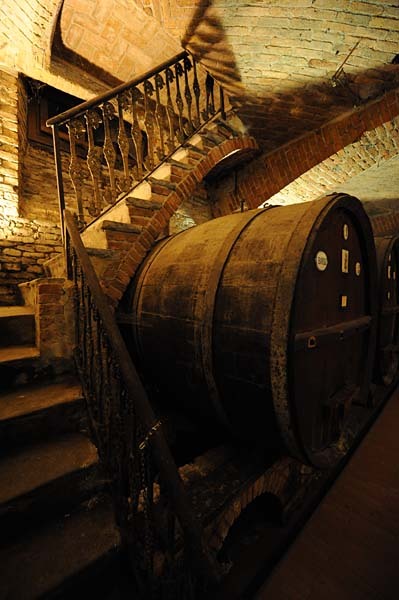 The property went to the major creditor, Siena's Monte dei Paschi (the world's oldest bank, founded in 1472) while the name was bought by the Gancia winery. Monte dei Paschi settled upon Fontanafredda (Cold Fountain) for their new estate, after a very cold fountain on the property. And thus things remained until a couple of years ago, until Oscar Frinetti, the man behind Eataly http://eatalyny.com/, approached Monte Dei Paschi and asked if he could buy into the winery. They said yes, and now he is the major shareholder. Little has changed since his arrival, at least on the grounds: the team working in the winery is still the same. 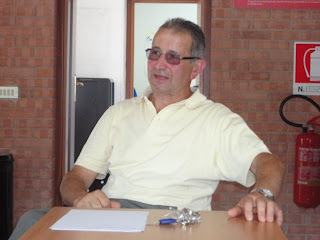 However, Mr. Farinetti also approached the folks at Gancia and asked them to give back the Mirafiori name. 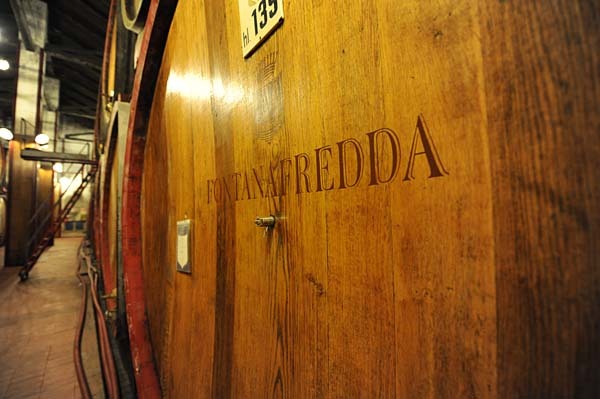 Gancia did, and now Fontanafredda's top line is called Mirafiori. At the end of the second day of our visit we returned to Fontanafredda, where we were greeted by Monica Tavella and Danilo Drocco, who gave us a tour of the winery, that ended in the new, rather space-age tasting room they just opened. This is from an east-facing vineyard, and it spends two months in large wood prior to bottling. Deep cherry ruby with cherry rim. The bouquet is rich, with lively violets and some berry fruit supported by graphite shavings and bitter almonds, with almond blossoms as well and pleasant savory notes. Quite pleasant. On the palate it's fresh, with bright cherry fruit supported by lively acidity and tannins that have bright peppery accents, and flow into a bright warm cherry finish with violet accents and a peppery tannic underpinning. It's quite aggressive, and is a wine that will drink very well with fattier foods, for example grilled meats such as sausages or lamb chops. If you like the style you will enjoy it. This is harvested a bit earlier than some, to have ripeness but also acidity. It spends a year in large wood, without racking. Deep pyrope with black reflections and cherry rim. The bouquet is closed at the outset, and bordering on reduction, demanding that one swish it to oxygenate it, as it opens it reveals berry fruit and acidity shot through with graphite shavings and some acidity that increases as it oxygenates. On the palate it's bright, with rich cherry fruit supported by bright berry fruit acidity and by tannins that are fairly light, and there is a touch of sweetness too that comes from alcohol content -- it's 14%, and it flows into a warm tart cherry finish. Pleasant in a fairly aggressive key, and will work very well with succulent meats. Particular, however, and if you like heavily oaked Barbera it won't work for you, because though there is some wood that smoothes some, the acidity very much rules, and leves the teeth squeaky clean. This is from grapes that are exposed to the East, and therefore don't have the terrific tannic structure Barolo would have after two years; it spends a year in oak, during which it is never racked, and is almandine with black reflections and almandine rim. The bouquet is savory, with rosa canina and minerality, berry fruit, earthiness, spice, leather and leaf tobacco that is fairly intense, and p0elasantly green. Quite a bit going on. On the palate it's rich, with bright berry fruit supported by sweet tannins and fairly bright acidity; the tannins are peppery and fairly aggressive, and flow into a clean bright cherry laced finish with a peppery underpinning that's quite pleasant. A perfect food wine that will work quite well with a steak or roast. This wine macerated 45 days on the skins after fermentation, and then, after the malolactic fermentation spent 2 years in cask, without racking. Deep almandine with black reflections and almandine rim. The bouquet is powerful, with leathery berry fruit supported by leaf tobacco and brambly accents, also greenish vegetal accents, spice, alcohol and pleasant spice, with underlying licorice root, sea salt and cedar, supported by slight pungency of alcohol. On the palate it's full and smooth, with powerful cherry fruit supported by mentholated accents -- the alcohol confers a degree of mineral sweetness -- and spice, and by bright acidity and warmth, while the tannins, which are sweet at the outset and powerful throughout, become drier in the finish, and this is a factor of youth. Quite pleasant with considerable depth, and though it ahs a youthful brashness to it now, it is quite elegant and will go places with time. Impressive. With this wine they assembled the best grapes of the vintage, picking from here and there to obtain the best from everywhere. Deep black almandine with black reflections and almandine rim paling to white still; it has held remarkably well. The bouquet is powerful, with rich berry fruit laced with green leather and leaf tobacco, and also with spice and some rosa canina with considerable underbrush as well, and some bitterness too. Quite pleasant. On the palate it's full, and rich, with powerful cherry fruit supported by savory tannins and fairly brisk acidity that flow into a clean savory tannic finish. Quite pleasant, and will work very well wit h grilled meats or roasts; it's still very young -- and this comes out in the dryness in the finish -- but displays considerable potential, and though one could drink it now with grilled meats along the lines of a porterhouse steak, it will also age very well for 15 or more years. Needs time still, and is remarkably young. Almandine with almandine rim. Rich bouquet with leaf tobacco, spice, acidity, some chocolate and carob tending towards tamarind, balsamic notes, sea breeze. Beautiful and very much alive. The palate is bright and rich, with lively sour berry fruit supported by tamarind-lemon acidity and tannins that are bright and rich, with a warm burr that flows into a fairly long clean bright finish. Very impressive, and though it is full mature one wouldn't guess its age. The bouquet is rich, but not as rich as the 67's, with berry fruit and leather mingled with spice, leaf tobacco, musty dried orange peel, licorice root, and underlying spice with savory acidity providing direction. On the palate it's full, rich, and smooth, with spice and berry fruit supported by tannins that have sweet leathery accents. Terrific finesse, though not as lively as the 67, nor does it have the power. But it does have quite a bit to say. Deap leather almandine ruby. The bouquet is rich, with spice, leather and leaf tobacco mingled with some hardwood ash and underlying savory accents, minerality, and some mineral acidity. Considerable finesse. On the palate it's full, rich and deft, with minerality mingled with underbrush and spice, and moderate fruit, with nice acidity as well. Great depth and elegance. Lively ruby with brilliant reflections. The bouquet is bright, with berry fruit and greenish leathery accents mingled with spice and sea salt, with some underbrush as well. Nice depth and elegance. On the palate it's rich and full with pleasant fruit supported by smooth sweet tannins that flow into a clean deft finish. Quite fine. Deep ruby with brilliant reflections. The bouquet is fairly rich, with berry fruit mingled with spice and cedar, and leaf tobacco too, with underlying rosa canina and red berry fruit. Quite pleasant. On the palate it's full and bright, with rich berry fruit supported by deft acidity and tannins that are smooth, with hints of spice and flow into a clean rich finish. Considerable elegance and very pleasant to sip. By comparison with the 2004 Mirafiore its tannins are smoother and richer, and I found it to display greater finesse. Cherry ruby. The nose is bright with cherry fruit and some greenish vegetal accents, berry fruit, and warmth -- pleasant but in its infancy. On the palate it's full, and bright, with red berry fruit supported by tannins that have a youthful peppery burr, while mineral raspberry acidity provides direction, and it flows into a rather bright angry finish. It's pleasant, and has considerable potential, but needs time. Something to wait for. There is the Costiera whose feet soak in Ulysses's Sea, and the Costiera whose head is in the mists wrapped around the pepella, ginestra, San Nicola, ripoli, binacazita, tintore, piedirosso, and sciasinoso vines. This extraordinarily vertical land, with the port of Amalfi below, and the highest bastions of the Repubblica overlooking the Chiunzi Pass above, is a tiny enological gem. It seems just yesterday that the touristy restaurants served wine in ceramic pitchers, while the elegant restaurants just had French wines. In those days they fermented grapes from all over the south to make easy watery wines unable to express the character of an area like none other in the world, a place where nature and humanity come together with unequaled balance, to the point that it's impossible to tell which influenced which: the houses nestled among the rocks and the bell towers that rise up, or Nature, who brings together rock, earth, water and sky in the space of a few yards? 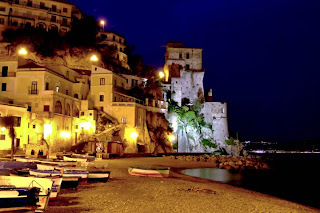 With the establishment of the Costa D'Amalfi DOC, and its three subzones, Furore, Ravello, and Tramonti, the situation suddenly changed. For the better. In 1983 Marisa Cuomo led the way with the help of Luigi Moio, and suddenly great wines of the sort that linger in memory were possible. Then came the rush from Tremonti, with Fortunato Sebastiano from Gigino Reale in 2002, and Gerardo Vernazzaro from Monte di Grazia in 2004, Prisco Apicella from the Prisco Apicella winery -- the first in the region to bottle -- established by the Prisco Apicella family in 1977, and Carmine Valentino at the Fattoria San Francesco in 2004. 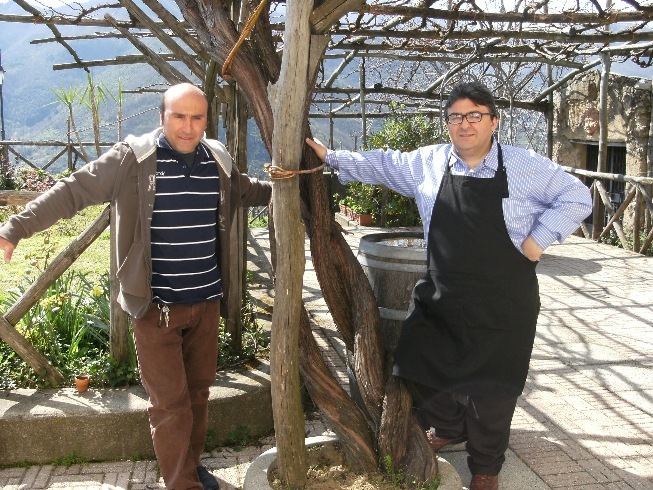 Nor is this all; in the past few years there have been developments in Vietri, the extreme southern end of the Costiera, where Vigne di Raito (formerly Fortunato) and 'O Cammariello are followed by Mario Mazzitelli. 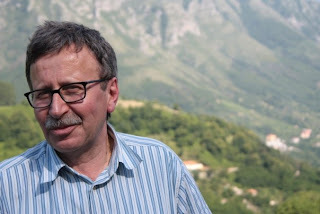 And though the traditional parterre of Ravello has seen the closing of Episcopio, Ettore Sammarco, scraped his winery from the rocks along the climb from Amalfi to Ravello in 1965, has gained new vigor with son Bartolo's entry into the cellars. Small estates, small numbers, but steadily increasing quality, which ever more frequently crosses the boundary into exciting. To the point that we can perhaps say that it is this wine making region, more than others, that can look Irpinia in the eyes, thanks to its marked acidity, minerality, and ability to improve and dominate with time. 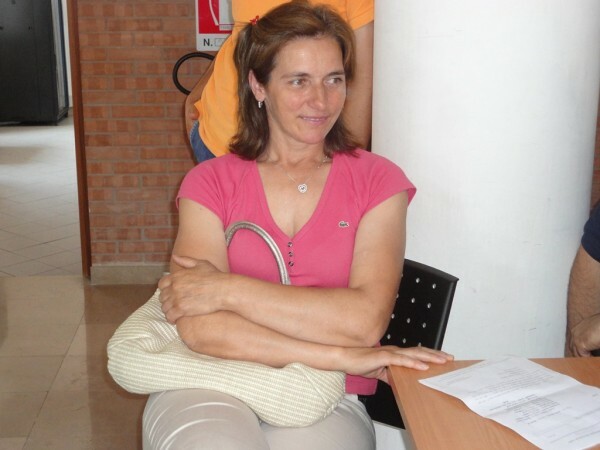 Of the 90 hectares registered in the Albo della DOC, 39 are white. However, only 29 are effectively producing, on average 100 quintals per hectare: this comes to 1641 quintals of grapes, 1418 hectoliters, or a little more than 190,000 bottles. A drop in the Campanian sea, but a unique and precious drop. We tasted through them in the occasion of the presentation of the new Colatura di Alici di Cetara and noted, once again, that the adage that Campanian wines should not be opened earlier than a year from the harvest date to give the bottle time to work its magic is true. A territorial blend in which Falanghina provides structure and freshness, while Biancolella gives aromas and freshness. 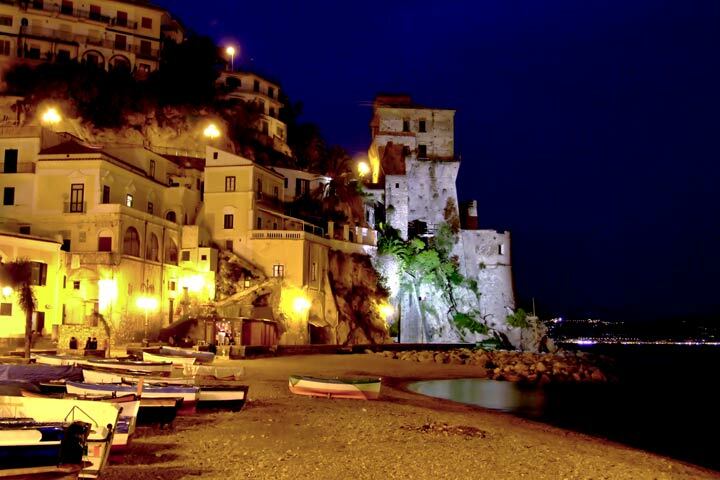 An excellent, typical sample, and unbeatable with the classic dishes of the Costiera Amalfitana. Still floral, with citris accents, on the palate a slightly soft attack becomes tonic and dynamic, leading into a clean dry finish. A fist of steel in a velvet glove. Slightly overripe fruit, and a brief time in oak: they are seeking complexity in this local varietal blend, which in this vintage is already balanced and fairly soft. To drink now, because it's ahead with respect to the base wine. This base wine, with which the winery changed gears a few years ago, always has good fresh fruit. On the nose pears and lemons, and a dry attack that doesn't try to ingratiate. On the palate the acidity is still doing its own thing, but the wine will certainly have a lot to say in the next 2-3 years. Perhaps the freshest wine of all, with power beginning on the nose, where citric and white fruit prevail. On the palate it's decisive, with no sweetness to soften it; acidity runs the show through the finish, which is very persistent and enjoyable. It will also work with richer dishes. A selection of the best grapes, and a slight delay in its release, as long as they can ignore market pressures. Great raw materials, speed, and body. The nose is still citric, with mineral, broom (the shrub), and thyme. An impressive progression from mid- palate to a dry, savory persistent finish. The grapes are those from the spectacular terraces of Furore, and the wine presents with considerable acidic verve from the outset, with on the nose nice floral accents, fruit, and vegetal echoes. On the palate fresh, long, and full bodied. At present nicely balanced. The blend from Ravello is always softer than Furore, with well integrated acidity from the outset, with aromas of broom shrubs, tangerine skins, sage. On the palate it's thinner, but with a persistent and very pleasant finish. The wine that led the general public to discover the wineries and terroir. The time spent in barriques clearly matched the type popular in the 90s. Now wood accents may seem out of fashion, but if one is blessed with the patience to wait a few years this is an interesting wine in the style typical of Luigi Moio. The 2009 promises well thanks to lively acidity, considerable structure and tropical fruit on the nose. The least controlled of all the whites revolves around savory freshness. The nose brings up citrus, thyme and slight fumé. On the palate fresh, long, full, and quite interesting, a wine that will age beautifully in the coming years. It was fairly obvious at the outset, but a year after the harvest it is fully mature, quite fresh, compact, and a nice long finish with no hints of weakness. A wine that, thanks to its considerable freshness, will also work well with substantial dishes. 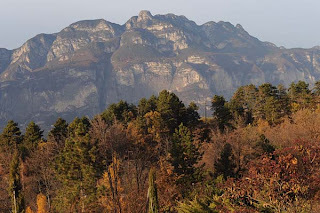 Mention Italian sparkling wines, and one might not necessarily think of Trentino. 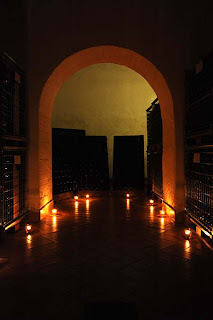 The connection is certainly there, however, and the city boasts one of Italy's oldest Metodo Classico traditions: In the earliest 1900s Giulio Ferrari decided to try his hand at making sparkling wines in the cellars of his family palace, on Piazza Duomo. The man was extraordinarily exacting, and for fear that contact with base metals might damage his wine, ordered a disgorging machine with the parts that might come into contact with the wine made from sterling silver. 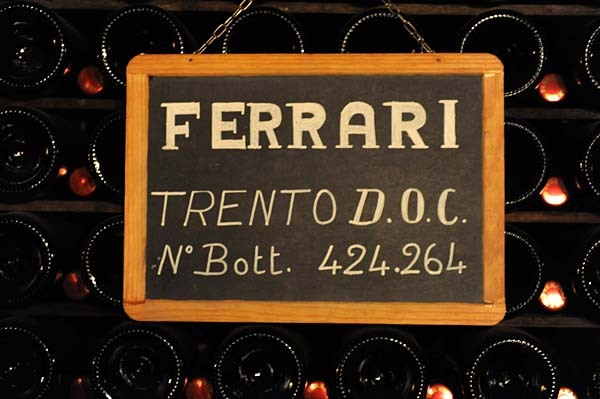 Ferrari still has the disgorging machine, though it is no longer in use -- Giulio Ferrari was childless, and when he reached a certain age approached Bruno Lonelli, a wine merchant based in Trento who had several children, and asked him if he wanted to do more than just sell wine. Bruno decided he did, and while maintaining Giulio's standards gradually increased production, to the point that Ferrari had to leave Piazza Duomo for a much larger cellar and winery complex in the early 1970s. They are now one of the most important producers of quality Italian sparkling wines bar none. Unfortunately, few in Italy (to say nothing of outside the country) realize that Ferrari is just an important part of a much larger and more complex picture. 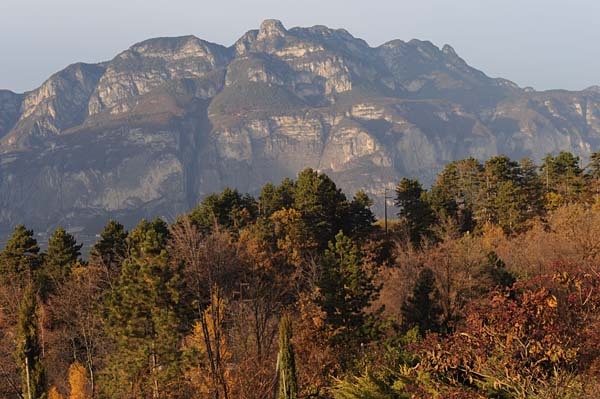 In short, Trentino is a unforgiving land not suited to much in the way of agriculture, but vines do well, and the cooler climate French varietals, Chardonnay and Pinot Nero in particular, have acclimatized themselves very well, finding the strength to thrive up to elevations of as much as 800 meters. 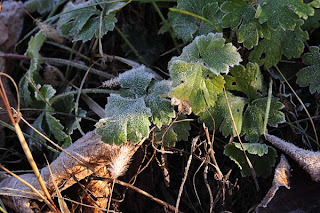 These are mountain grapes, which enjoy the brightness of the sun during the days and experience brisk temperature drops at night that help to bring out finesse and elegance of a sort that is much more difficult to obtain at lower elevations. 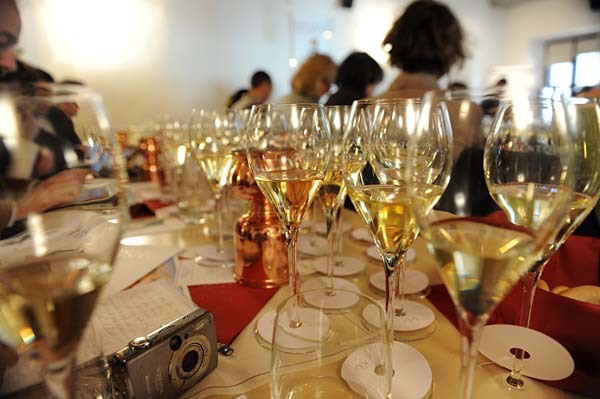 Then why isn't Trento a household name, the way Champagne is and Franciacorta is becoming? There are a number of reasons. Foremost is time; the folks in Champagne (whose vineyards rarely exceed 300 meters in elevation) have been at it for centuries, and as a result are well known. 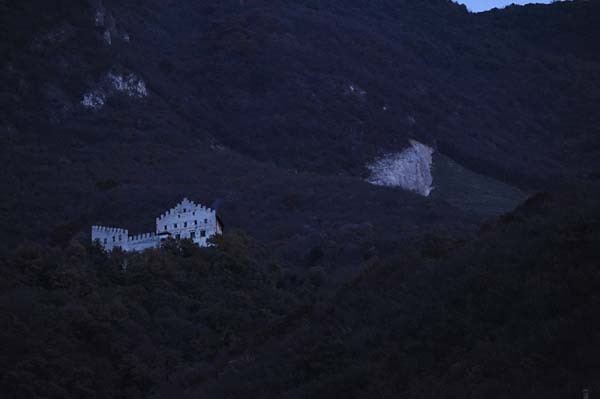 The people in Franciacorta instead boast vision, and though their land isn't for the most part as good as Trento's (in terms of soil or elevation), they are for the most part industrialists with a passion for wine such that they are willing to devote considerable resources to making it, and are also willing to swallow their differences and work together to promote their wines and their region, presenting a unified front (whose importance is difficult to overstate) to the world. Trento instead has Ferrari, which is large by any standards, a number of cooperative wineries, some of which are quite large, but all of which consist of large numbers of growers with small amounts of land (La Vis, for example, has 1300 members, who farm a total of 1300 hectares), about 30 small winemakers with 10-15 hectares, more or less. Three different realities, with different interests and priorities, and until recently the front they provided the world was fragmented. But they are working to correct this, and for the past few years have held a presentation called Bollicine su Trento November. The event includes a stand-up presentation of all the winemakers who make Trento DOC, and this year also featured five three-vintage verticals of Trento DOC Riserva from five producers. Some of the verticals featured relatively recent vintages, but others dug considerably further back into the past. The even organizers also set up winery visits for us, and it was an extremely interesting (and busy) three days, which left me wishing I had taken an interest in Trento's sparkling wines years ago -- the region's wines are very good, and if you like to travel visiting the wineries is almost as much a delight for the eyes and ears as it is for the nose and palate. 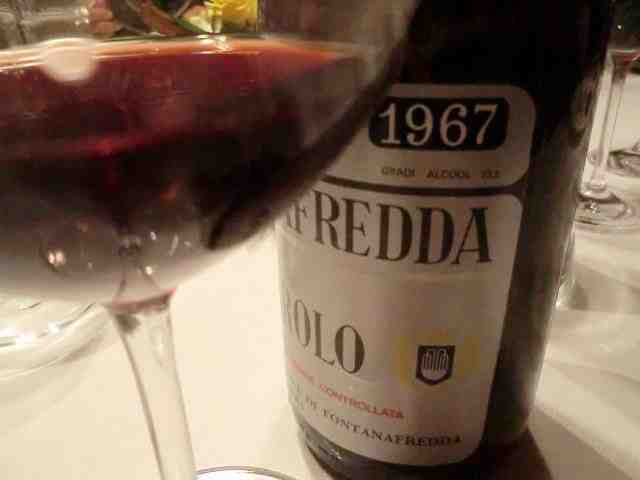 Getting down to specifics, Trento DOC is made exclusively following the Metodo Classico, i.e. bottle fermentation on the lees to produce the sparkle, followed by remouage and degorgement to remove the lees, and the addition of Liqueur d'Expedition (or more wine in dosage zero) prior to recorking. The primary varietals are Chardonnay and Pinot Nero, and the minimum time on the lees is 24 months for Vino Base (by comparison, straight Champagne must stay on the lees for a minimum of 15 months), while the Riserva must spend at least 36 months on the lees. These are minimum times: Many of the winemakers keep their wines on the lees for considerably longer; while indicating the vintage is not required, and many winemakers don't for their Vino Base, indicating when the wine was disgorged is, and it does give one (me at least) a certain feeling to look at a bottle that is close to 20 years old, and see it was disgorged just last year. Total production is about 9 million bottles, while there are 37 producers. Before we began tasting, we were told that because of climatic conditions, as a general rule the wines of the 2000 decade have revolved more around freshness and maturity, whereas those of the 90s revolved more around richness. 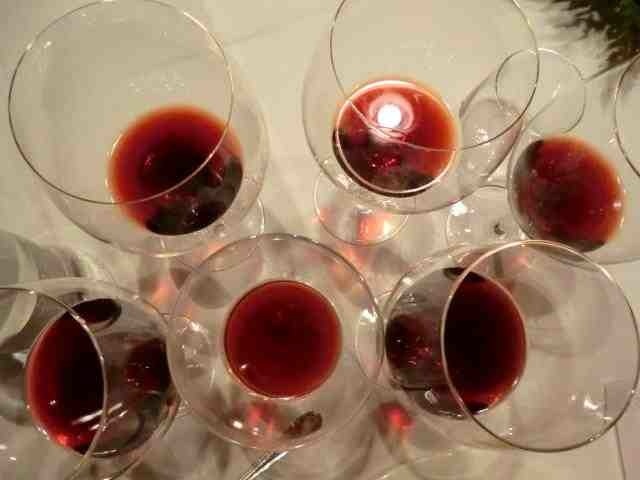 2006 and 2005 are considered the best of the past decade, and 1994 and 1991 the best of the previous decade. 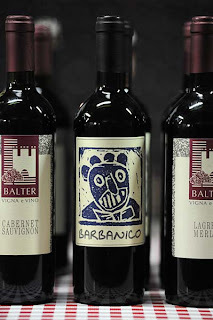 Our first vertical was Abate Nero, which is known for making wines that are quite essential. It's a small winery, with a total annual production of about 60,000 bottles. Pale brassy yellow with brilliant brassy reflections. and fine perlage. The bouquet is rich, and bright, with white berry fruit and some wet breadcrumbs, spice, some gunflint, and hints capers and salt. Airy, quite fresh, and savory. On the palate it's fairly rich and quite mineral, with tart acidity and considerable minerality that brings to struck granite to mind, and by the sparkle, flowing into a bright tart finish. Very tight, a lean wine that is quite pleasant and will work well throughout the meal. Quite impressive considering the heat of the vintage -- it doesn't have the steely minerality of the cooler 2002, but is quite nice and a wine traditionalists will greatly enjoy. Bright brassy gold with brilliant brassy reflections and fine perlage. The bouquet is elegant, with wet breadcrumbs and hints overripe white pear, minerality, and petroleum. Tight, taut, and with tremendous finesse, but keeps to itself. Some candied fruit too, but not much. On the palate it's beautiful, with bright fresh minerality and savory notes supported by lemony acidity, sparkle, very long finish fading into citrus and minerality with considerable sea salt as well. Very nice, and a wine to converse with. Note: 2001 was cool and wet in Trentino. Brilliant brassy gold with brilliant brassy reflections, and fine perlage. The bouquet is fairly intense, and more mature than either the 2002 or the 2003, with bitter orange marmalade and some spice, supported by some bread crumbs, some wood smoke, a certain pungency from the lees, and slight gunflint. On the palate it's full, with fairly rich minerality mingled with bitter almond marmalade and some spice, sea salt, and fades into a rather bitter finish with orange marmalade and gunflint. Very different from the 02 and 03, and I found it a bit tired, more settled than the other two. Pale brassy white with brassy reflections and fine perlage. The bouquet is rich, with crisp apple and fresh savory notes with some sea salt and pleasant minerality with some mineral acidity. Very clean. On the palate it's bright and quite mineral with creaminess and peppery accents from the sparkle, and flows into a clean mineral finish. Minerality in a glass and quite nice either as an aperitif or with foods. Pale brassy white with brassy reflections and fine perlage. The bouquet is fairly intense with vegetal notes and pine needles, some white berry fruit, wet breadcrumbs, and considerable minerality. On the palate it's ample and fairly rich, with softness from the creaminess of the sparkle and vegetal laced white berry fruit and pleasant minerality that flows into a clean mineral finish with some bitterness and peppery accents from the sparkle. Quite pleasant and eminently approachable, displaying considerable finesse and elegance. While one could drink it as an aperif it will also work with foods. Pale brassy white with brilliant brassy reflections and fine perlage. The bouquet is rich, with menthol and pine needles mingled with slight tart white plum, brambles and greenish minerality approaching gunflint. On the palate it's full, rich, and quite mineral with beautiful balance that is quick to write about but quite impressive. Great finesse and very pleasant to drink. 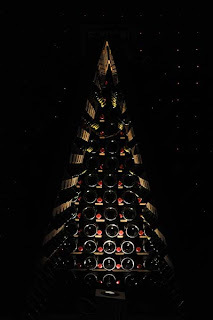 Cavit is much, much larger than Abate Nero -- they make 300,000 bottles per year of Altemasi alone. Brassy gold with brilliant brassy golden reflections and fine perlage. The bouquet is moderately intense, with breadcrumbs and some bitter orange marmalade, some mint, slight balsamic accents, hints butterscotch, and wood smoke. On the palate it's ample and mineral, with warm minerality and some savory gunflint supported by fine perlage, that adds fullness, and flows into a fairly mineral finish. It's approachable, but not really tight, a bit laxer and less demanding. Easier to drink but less interesting to converse with. Pale brassy gold with brilliant golden brassy reflections and fine perlage. The bouquet is moderately intense, with minerality and some pungency, slight gunflint, some bitter orange marmalade, spice, slight breadcrumbs. On the palate it's savory, with warm citric fruit -- bitter orange and savory notes, some sea salt, and slight gunflint; the sparkle provides creamy fullness, and flows into savory finish that's fairly soft. It's not as tight as I might have liked, and a bit tired. A fellow taster who is more drastic says, "Dull." Pale brassy gold with brassy reflections; it's considerably less charged than the 2000 in terms of color. The bouquet is fairly rich, with some honey, some beeswax, some bread crumbs, slight gunflint, and sea salt with hints of rosemary. On the palate it's soft, and full, fairly round,, with Delicious apple fruit supported by savory notes and minerality, with some underlying bitterness, and flows into a fairly long finish that settles into dried apples. It is a bit settled, but then again it's also 14 years old, and though it is on its way down it is still drinkable, with a story to tell. When it was in its heyday it was superior to the 2000. Pale brassy yellow with brassy reflections and fine perlage. The bouquet is mineral, with some vegetal notes, some spice, and moderate acidity; it's fairly bright. The palate reflects the nose, with fairly bright minerality, some savory accents, and pepper from the sparkle, which also confers a degree of creaminess, and flows into a savory mineral finish. Fairly direct. Non Vintage. It's pale pink with onionskin rim and fine perlage. The bouquet is moderately intense, with slight sour red berry fruit supported by berry fruit acidity. Spice, and some breadcrumbs. On the palate it's fairly bright in a direct key and quite fresh. Up front, and simple. From a magnum. Pale brassy yellow with brilliant brassy gold reflections and fine perlage. The bouquet is fairly intense with greenish accents and spice supported by some minerality and herbal accents, and gunflint bitterness mingled with sea salt. On the palate it's quite mineral, in a direct key, with clean savory accents supported by minerality and peppery notes from the sparkle, flowing itno a clean bright finish. It's direct, but does display pleasant savory notes and minerality. It profited from having aged on the lees in a magnum. Metius This has, we were told, more Pinot Nero, and more oak, and as such represents a break with tradition. Production is 15,000 bottles. Pale brassy yellow with brassy reflections and fine intense perlage. The bouquet is bright, and intense, with gunflint supported by sea salt, spice, some bread crumbs, some butterscotch too, and smoke; there is nice complexity in a younger key. On the palate it's bright, and quite mineral, with gunflint bitterness and some bitter orange/dark caramelized sugar, flowing into a bright rather bitter savory finish. Pleasant, and if you like the style, which is more modern, with the butterscotch and caramel more evident, you will enjoy it, especially thanks to the presence of pleasant sea salt that makes it quite clean. Pale brassy white with brassy greenish reflections and fine perlage. The bouquet is intense, with gunflint and minerality supported by more minerality, acidity too, and spice; it brings to mind struck granite. A cooler vintage wine, and with more depth because there's less of the richness that comes with greater ripeness (sparkling wines revolve much more than still wines around acidity, and consequently ripeness is not the central goal it usually is with still wines). On the palate it's full, and mineral with some gunflint and bitter orange marmalade bitterness shot through with slight caramel and butterscotch; it shows nice depth, and flows into a pleasant savory finish. I found the nose more interesting than the palate, which is somewhat lacking in brightness. It's a little less together. Brassy yellow with brilliant brassy reflections and fine perlage. The bouquet is fairly intense, with bread crumbs, gunflint, minerality, some spice, bitter orange marmalade, dark caramelized sugar, some menthol and some alcohol. On the palate it's bright, with lively mineral laced citric fruit supported by bitter orange marmalade acidity and some peppery spice that's also the sparkle, and it flows into a clean mineral finish. Quite pleasant, and it's one of those wines that may seem simple at first sip, but that you then realize you have stopped doing whatever you were doing because it has captured your attention. Quite enjoyable. The Istituto is both a very well respected winemaking school, and a highly respected winery. 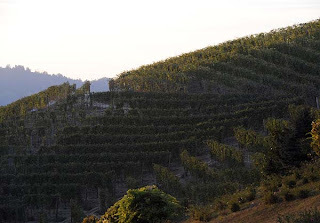 The vineyard used to make the Riserva del Fondatore is high, at an elevation of 700 meters. 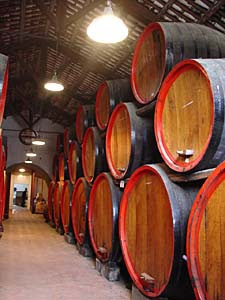 Annual production of the wine is 10,000 bottles. Pale brassy white with brilliant greenish brassy reflections and fine perlage. The bouquet is fresh, with bright brambly minerality and spice, slight hints of petroleum, and a fair amount of minerality, with some orange blossoms and bitter almonds as well. Quite fresh. On the palate it's bright, with savory minerality and mineral acidity supported by peppery notes from the sparkle; it's approachable in a very linear high altitude key, with nothing superfluous at all, and if you like the style you will enjoy it. Pale brassy yellow with brilliant brassy reflections and fine perlage. The bouquet is fairly intense, and mineral, with considerable gunflint and some underlying bitterness, coupled with some spice, slight bitter orange marmalade, and warmth. On the palate it's bright, with lively savory minerality supported by peppery accents from sparkle and by some gunflint bitterness that flow into a fairly long gunflint laced finish. It's like striking granite and is quite essential, nothing superfluous, and fairly direct. If you like the style you will enjoy it. I did, though a fellow taster was less impressed, saying he found it a touch rough. Brilliant brassy gold with brilliant reflections and fine perlage. The bouquet is fairly intense, entering maturity, with citrus mingled with petroleum, spice, menthol, bitter almonds, and some hints of wet bread crumbs. It's clearly mature, and there's something blocky about it. On the palate it's ample, and rather direct, with minerality and bitter almonds supported by sea salt (capers) and savory notes that flow into a long savory finish with slight sparkle and underlying caramelized sugar bitterness. The finish is a little dry, and to be honest I had expected a more from it. This is a Chardonnay, from high vineyards. All three wines were disgorged in 2010 (!). Pale brassy yellow with brilliant brassy reflections and fine perlage. The bouquet is mature, with dried apple and some herbal accents, wet bread crumbs, minerality, and well-cooked-down bitter orange marmalade with some gunflint. It's a wine that has a fair amount to say, but is demanding in a way that makes it more for wine lovers more than the general public. On the palate it's full, with fairly rich minerality and some citric spice supported by dusky bitterness and savory accents, and sparkle that covers black pepper spice, and it flows into a clean bitter finish. Quite clean, and pleasant, in a mature key, and if you like the style, which is quite mineral, and savory, with considerable finesse, it you will enjoy it. Pale brassy gold with brilliant reflections and fine perlage. The bouquet is elegant, with considerable minerality and some gunflint, quite fresh, and some breadcrumbs with hints iodine and saffron, and also some brambly notes -- greenish herbals accents that bring to mind a briar patch. Quite a bit going on, and impressive. On the palate it's just as impressive, with bright savory minerality supported by greenish accents and pleasing vegetal minerality and sea salt, while the sparkle confers peppery spice and creaminess, and it flows into a clean bright mineral finish with acidity and underlying peppery accents from the sparkle. Very pleasant to drink. One of those wines one hates to pour out at a tasting. Pale brassy gold with brilliant brassy reflections; it looks younger than many of the younger wines, and has fine perlage. The bouquet is impressive, with beautifully fresh minerality supported by some splice and slight bread crumbs, and minerality, some wood smoke, and bitter caramelized sugar with some gunflint as well. Struck granite; while the panel leader talks of other things I find it to be minerality in a glass, and this is the elevation of the vineyards. On the palate it's bright and fresh, with brilliant minerality and savory notes supported by clean bright minerality and citric notes, with peppery accents from sparkle, and flows into a long clean savory finish. Absolutely impressive, extraordinarily fresh. A fellow taster not normally given to enthusiasm says stunning. I agree. 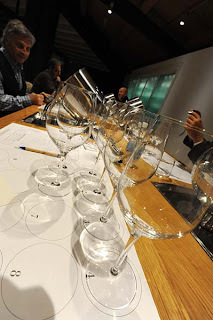 The verticals were followed by a stand-up tasting of the current releases of Trento DOC. Rather than simply list my notes for the afternoon here, I will work them into the notes I took during our winery visits, and then continue with the notes from the wineries whose wines I tasted without visiting them. It seems the easiest way. The second day of the Bollicine su Trento was dedicated to winery visits, and it was nice mix: We started with Maso Martis, which is a small family run winery somewhat north of Trento on the left flank of the Val D'adige, then visited Ferrari, by far the most important producer of sparkling wines in Trentino, stopped for a light lunch at the Locanda Margon, and continued on to visit Zeni and Endrizzi, who is the northernmost winemaker in Trentino, with vineyards "overlooking the border," i.e. a stone's throw from the German-speaking Sud Tyrol. We finished with a visit to La Vis, one of the major cooperatives, where we also had dinner. 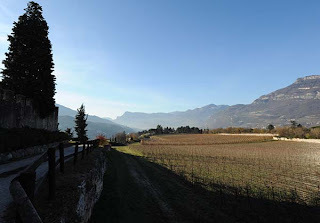 The third day began with visits to the south -- several of our company were leaving from Verona -- and specifically Balter, a small fairly new winery high up the side of the valley outside Rovereto, and then the Cantina D'Isera, Trentino's smallest cooperative. 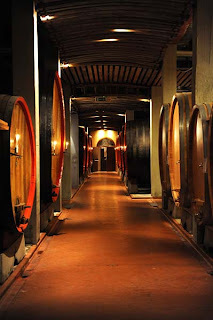 We'll begin with the notes I took during winery visits, and finish with wines I tasted only in Trento. Base Spumante 2011: Fermentation is done and its acidity is 9 grams/liter, while it is 11.4% alcohol. Nice lemony fruit with some honeydew melon and spice, and slight mint. Delicate, with acidity apparent -- it's quite tart with lemony fruit that's tooth-cleaningly lemony, with pleasant underlying sea salt, the finish is quite long, and also mineral. Base Pinot Nero 2011: Fermentation done, vinified in Rosé. 11,3% alcohol, 8.5 grams/liter acidity. Pale pink. Was on skins for two days prior to racking. Delicate aromas, with red berry fruit, some currants, some strawberries, slight tree bark too, also some sweetish accents. Nice depth. On the palate it's bright, with lively acidity and fairly bright red current fruit and slight dusky accents in the finish. They don't put the vintage on their base wines because if one decides to indicate the vintage one also has to tell the bureaucrats how long the wine will be on the lees, and if one decides extend the time on the lees complications can arise. 70% chardonnay, 30% Pinot Nero, 24 months on the lees for the 750 ml bottles (magnums spend more). Pale brassy yellow with greenish reflections and fine perlage. The bouquet is fairly intense, with dusky grassy vegetal notes and considerable gunflint, also savory notes and fairly intense wet breadcrumbs as it opens, coupled with slight butterscotch. On the palate it's bright, with fairly rich mineral laced lemony fruit supported by gunflint and considerable minerality, and flows into a warm savory lemon laced finish with underlying crisp minerality. Pleasant, and will work nicely as an aperitif, and is also powerful enough and with enough backbone to work well throughout the meal. They said it has 7 grams residual sugar, but it's not that apparent, an indication of how brisk the acidity is. And acidity is interesting. 70% Pinot Nero, 30% Chardonnay that is barrel fermented. Pale greenish brassy yellow with fine perlage. The bouquet is fairly intense, with butterscotch and greenish minerality mingled with some sea salt and some vegetal accents. On the palate it's ample, and creamy, with moderately intense savory notes and sea salt supported by fruit that is a mixture of yellow and some red forest fruit, and flows into a warm fairly mineral finish with some sweetish accents -- there's less acidity to be balanced. It's considerably more delicate than the base wine, and is more a wine to sip with friends than at the table. I found it a touch more settled than the base wine, whose verve I missed. This is their Riserva Speciale; the first vintage was 1999, a selection of their best grapes. Until 2003 the relative proportions were 70% Pinot Noir, 25% Chardonnay, and 5% Pinot Meunier, but now they do adjust it some from vintage to vintage. For example, 2007 was excellent for Chardonnay, so they increased the proportion of Chardonnay. They make it every year, but are not sure if 2003 will be good enough for release. 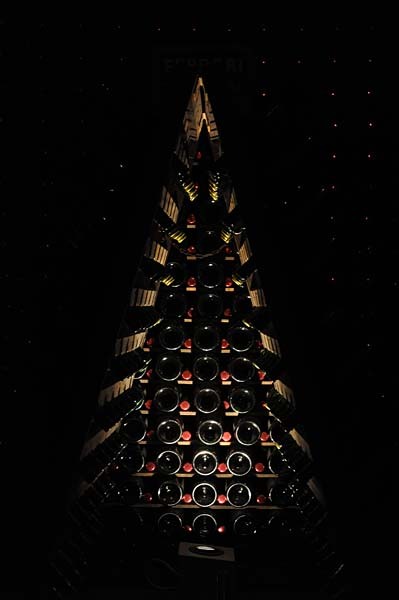 This 2002 has 4 grams/liter residual sugars, at the limit with extra brut, and was disgorged in June 2011. Brilliant gold with gold reflections and fine perlage. The bouquet is mature, with underbrush, wet bark, some citric accents, slight greenish notes, and some butterscotch. Quite a bit going on. On the palate it's bright, with rich savory notes and savory minerality with slight underlying butterscotch sweetness, and flows into a slightly sweet peppery mineral finish. It's a bit more particular, and a wine that you will like or not. I found it a touch more settled, with less of the acidity and minerality that struck me so favorably in the base wine, and a touch more caramel. It's a question of stylistic preference. Ferrari was founded by Giulio Ferrari in 1902, and as I noted in the introduction, passed to the Lunelli family when he realized he had no heirs to carry it forward. The third generation of the Lunelli family took over the direction of the firm in 2009. We were met upon our arrival by Camilla Lunelli, who is (among other things) Ferrari's Director of Marketing, and given a quick tour of the winery. I confess I fell behind more than once because there are many things to photograph. 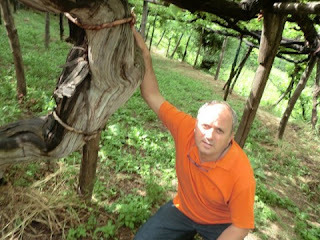 At the end of the tour we were met by Marcello Lunelli, who is the estate's winemaker. 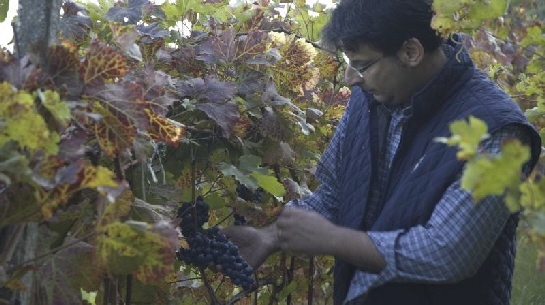 They have more than a hundred hectares of proprietary vineyards, and also purchase the grapes from 600 small landowners -- the entire production of some, and part of the production of others. Their vineyards are sustainably farmed, and they will soon have all the growers who confer grapes farm sustainably too. One thing I found interesting is the purchasing process, which doesn't work as I might have expected. 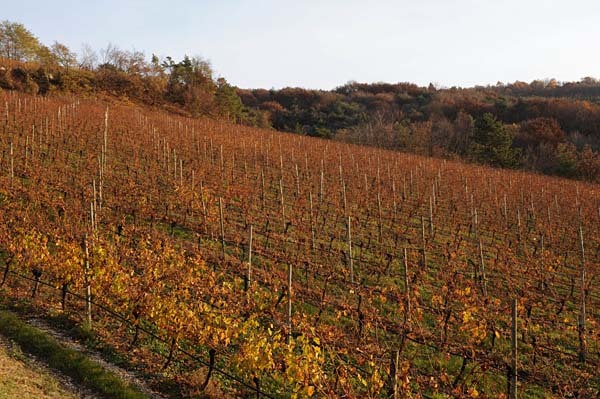 Though they do give growers a partial payment for San Martino (November 11th), what they pay then is only a ballpark estimate: The actual price of the grapes is set in February, and growers receive full payment in April. All of Trentino works this way, and that they do gives an idea of the degree of trust there is between grape growers and purchasers. Ferrari now keeps all of their sparkling wines on the lees for 30 months, and plans to increase the time to 36. 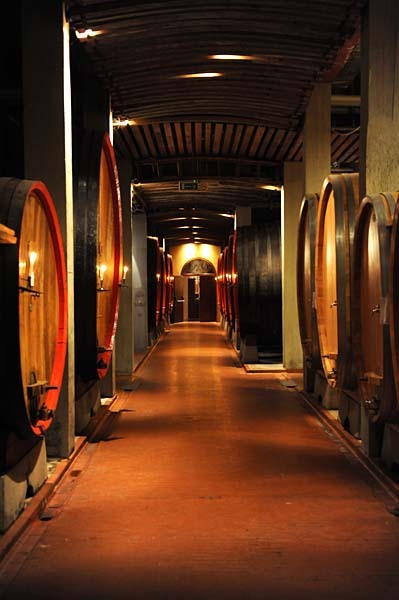 All of their wines undergo malolactic fermentation in tank, because they would rather it not happen in bottle. Pale yellow and cloudy, still lots of yeasts in it. Fairly bright, lively acidity with some lemon, creaminess from the yeasts, crisp ripe apple. Quite tart on palate, mineral and greenish with lively mineral acidity that cleans the teeth. Squeaky, and lively. This is a Blanc de Blancs, on the lees for 5 years. Lively brassy gold with brilliant brassy reflections and fine perlage. The bouquet is fairly intense, with butterscotch and some ripe apple (with hints dried apple), apple skins, moderately intense gunflint minerality laced with rosemary, and a certain airiness. Quite pleasant. On the palate it's fairly rich, and creamy, with pleasant apple fruit supported by smooth mineral acidity and creaminess from sparkle, underlying sour lemons, and flows into a clean rather lemony finish that has peppery spice accents as well, Pleasant, and will drink well with foods too. The first vintage of this was 1993. It's 80% Pinot Noir, 20% Chardonnay. Pale onionskin with slight salmon and fine perlage. The bouquet is rich, with savory notes and sea smoke supported by considerable gunflint and slight red fruit -- currants, strawberries, tart blackberries; much more mineral than the white grape Perlé. On the palate it's bright, with pleasant red berry fruit -- tart red currants and also white fruit, and mineral acidity and minerality, and flows into a fairly long clean mineral finish , while the sparkle confers a creaminess to it. Pleasant, bright but a touch softer than the Chardonnay Perlé. Which you prefer will be a stylistic choice. The first Ferrari wine not from white grapes. Pale brassy gold, slightly more charged than the blanc de blancs Perlè, with fine persistent perlage. The bouquet is deft, with greenish vegetal accents and bramble mingled with gunflint and slight butterscotch with underlying delicate red berry fruit. On the palate it's elegant, displaying considerable finesse, with clean mineral laced acidity and creaminess that flows into a long clean slightly creamy mineral finish. Tremendous finesse and quite elegant; Marcello says it's nervoso, nervous..
Chardonnay. They ferment this in large vats -- 40 hectoliter -- of Austrian oak (Stockinger is the cooper) because they studied back to the time when Bruno stepped in, and realized that Bruno and Giulio originally worked with large Austrian oak casks. The wine stays in cask for several months, until May, with battonage, and then they assemble the vats into the cuvée and bottle. 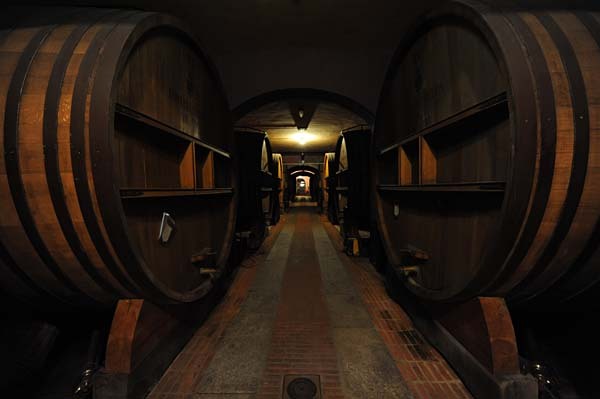 They have 10-12 vats set aside for the Riserva Lonelli each year. The best become Riserva, while the remainder go into other wines. The first vintage of Riserva Lonelli was 2002, though they started doing trials several years previously. Brassy gold with brilliant brassy reflections and finr perlage, finer than the Perlé. The bouquet is fairly intense, with rich mineral and butterscotch aromas supported by some gunflint and honey, with clover as well, and some greenish notes too. On the palate it's deft, and creamy, with bright savory lemony almost tamarind fruit supported by considerable sea salt, and flows into a creamy mineral finish with some gunflint bitterness. Quite pleasant; it will work quite well as an aperitif, and also has the backbone necessary to work well with delicately flavored foods. The vineyards, which are Chardonnay, are at 600 meters, and they are in the process of shifting from Pergola Trentina to guyot. The first vintage was 1972. Then it stayed on lees for 8 years, now 10. Brassy gold with brilliant reflections and fine perlage. The bouquet is powerful, and smoky, with wood smoke and butterscotch mingled with some caramelized sugar and slight dried apple; and as it opens some mentholated notes as well. On the palate it's full and creamy, with deft minerality, and flows into a long rather mineral finish with some sour lemon acidity and fruit. It's quick to write but very elegant, and a wine well worth seeking out. Brassy gold, it's a little lighter than the 2001, and with fine perlage. The bouquet is enticing, with deft minerality and spice, supported by hints of bitter orange marmalade, deeply caramelized sugar, spice, and terrific gunflint and struck granite. Beautiful complexity and most impressive. On the palate it's rich and creamy, with savory minerality supported by citric more grapefruit than lemony acidity with slight apricot and wood smoke, and sea salt with mineral accents that flows into a clean rich creamy savory mineral finish. Fantastic, and perhaps even better than the bottle tasted yesterday. This time a fellow taster not given to exaggeration said, "It's pretty amazing." 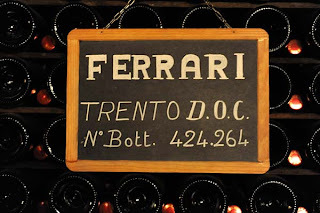 Ferrari is a tough act to follow, and Roberto and Andrea Zeni did so craftily, meeting us at the foot of the dirt road leading up to Maso Nero, a property with about 12 hectares of vineyards they purchase in the late-80s. We walked up, talking and enjoying the views, and upon reaching the Maso (a farm building; this one is called Maso Nero because the fires built in the hall by passers who wanted to warm themselves by blackened the walls) Roberto asked for a volunteer. Essi Avellan raised her hand and found herself clutching a pair of shears and learning about the three cuts (yesterday's, of the old growth, today's, for the next vintage, and tomorrow's, selecting the shoot to guarantee the future (see http://www.informatoreagrario.it/ita/riviste/vitincam/08vc12/potatura-vite.pdf) that one makes when pruning a vine. Her hands' on experience was followed by a quick visit to the cellars, which were nicely candle lit. We began with a 1986 Trento Doc (90-10 Chardonnay-Pinot Nero) that smelled remarkably of zabaione, and was quite mineral (and very much with us) on the palate. Then a 1995, their last blend, which was again very much with us, and quite nice. We finished with their latest experiment, a late-harvested Pinot Bianco that will be a dosage 0 when it has finished its time on the lees. It was quite interesting, but very much in progress. This is Chardonnay, and spent 42 months on the lees; 60% of the wine was barrel fermented. Pale brassy yellow with brassy reflections, white rim, and fine perlage. The bouquet is mineral, with some gunflint and some butterscotch mingled with wood smoke and hints of hay and clover, with slight tropical fruit as well. On the palate it's quite mineral, with bitterness and a degree of languidity supported by hints of tropical fruit and butterscotch -- the barrel fermentation -- flowing into a clean moderately mineral finish, while there are also peppery accents from the sparkle. This is a 60-40 Pinot Nero-Chardonnay blend, and is pale salmon with fine perlage. The bouquet is fairly rich, with minerality and mint mingled with some red currant and strawberry fruit, and supported by acidity and some greenish vegetal accents. On the palate it's fresh, with hints of seetness blaancing savory minerality and some acidity, while the sparkle confers creaminess, and it flows into a fairly bright mineral finish with hints of red berry fruit and a slight sweetish underpinning. It's fairly direct, and will drink quite well with foods, throughout the meal. Dusk was by now falling, and we climbed back on the bus to head north to Endrizzi, our next-to-last visit of the day. Endrizzi is one of the older estates in Trentino -- it was founded in 1885 -- and is known also for its red wines, so when Paolo Endrizzi asked us if we wanted something other than bubbly after our visit to the cellars we all nodded vigorously, and stood around a table sipping and nodding while he opened bottles and passed them along. This is from a vineyard planted to Chardonnay and Pinot Nero (66-33) high on the hill facing the winery, in a spot that overlooks the border with the Alto Adige. It's pale brassy yellow with brassy reflections, white rim,a nd fine perlage. The bouquet is intense and quite mineral, with brambly accents, some gunflint, wood smoke, slight tropical pineapple fruit, savory notes, and nice depth. On the palate it's bright, with crisp apple and savory minerality that becomes peppery and mineral as it flows into a warm finish with some acidity and slight red berry fruit notes, from the Pinot, and with time sea salt. Quite pleasant, and nicely structured with pleasing fullness. This was disgorged after 8 years, and is pale greenish gold with rellow reflections and fine perlage. The bouquet is quite elegant, and deft, with considerable finesse and minerality supported by some gunflint, very ripe white pears, sea salt, and nice acidity. On the palate it's bright, with lively savory sour lemon acidity supported by sparkle that confers creaminess and fresh minerality that flows into a long mineral finish. Very pleasant, and if you like the style, which is rigorous, revolving around acidity and finesse -- no nods to softness here, though there is a touch from the lees, not the dosage -- you will enjoy it. Nosiola is an indigenous white varietal whose name means "little nuts," a reference to the nuttiness it tends to display on the nose. It is traditionally made for local consumption, a light, savory low-in-alcohol wine that works very well in the summer months. Pale brassy white with a delicate floral nose with slight nuttiness and spice mingled with slight caraway seed; the overall impression is graceful and fresh. The palate reflects the nose, with languid, pleasingly savory white berry fruit supported by sea salt and some mineral acidity; it's quite fresh and will drink very well with simple foods now. Quite enjoyable, and as it is only 11.5 % alcohol (! ), it's the sort of wine one can drink by the bucket. 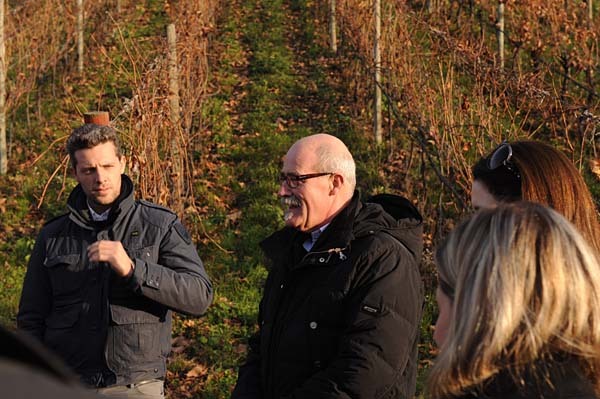 By comparison, Paolo's 2010 Gewürztraminer, which was harvested at about the same time, is 14% alcohol. Beautiful nose, but much more demanding than the Nosiola. 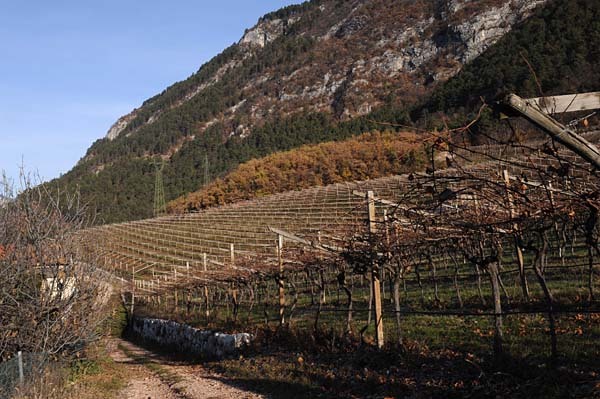 The northern half of Trentino is home to Teroldego, one of the few varietals that does as well on the flatlands as it does on the mountain slopes. The name, Paolo says, derives from Tyroler Geld -- German -- and it has been Trentino's leading red varietal for 800 years. Deep cherry ruby with cherry rim. The bouquet is rich, with berry fruit that has some lavender accents mingled with violets, spice, iodine, and plum cherry fruit supported by some vegetal notes. Quite pleasant, rich, and rather lavish. On the palate it's ample and rich, with fairly round bright cherry plum fruit supported by moderate tree bark bitterness and some acidity that flow into a dry mineral finish. Quite versatile, and will drink well with roasts and stews,.especially slightly drier meats. Trentino is not far from the Valpolicella, and a few years ago they began experiment with laying grapes out to dry during the autumn months in the Amarone style. Took several tries, but Mundus Vini, one of the leading German wine reviews was much impressed by it last year. This is 15.5% alcohol, and is deep cherry ruby with cherry rim, The bouquet is powerful, with rich cherry fruit supported by some caraway seed and slight cedar, and greenish accents that fold in well, while graphite shavings emerge as it opens. Lavish and quite elegant; impressive. On the palate it's rich, with cherry fruit supported by dusky graphite bitterness and moderate acidity, and flow into a clean rich slightly jammy finish. Quite pleasant in a rich fruit driven key that's kept on its feet by the tannins and their graphite bitterness, it is a modern deft wine in an international style, with an abundance of rich ripe fruit, and if you like the style you will enjoy it considerably. Even if you are more traditionally minded it will give you things to think about, and I found it an eye-opening discovery. Deep ruby with purple rim. The nose is rich and sweet, with violets and lavender mingled with slight sandalwood and some very ripe berry fruit. Intriguing and reminiscent of a Recioto, though more delicate, and displaying considerable finesse. On the palate it's bright and rich, with fresh cherry plum fruit supported by warmth and clean fresh sweet tannins that have some graphite bitterness,a nd flow into a warm sweet, slightly tannic finish. Pleasant and graceful, in a rathe rmore delicate key than most Recioto. This is a blend of Moscato Giallo, Nosiola, and other varietals. Brassy gold with apricot reflections. the nose is quite rich, and sweet, with hints of quinine and other medicinal herbs mingled with gooseberry, floral accents, yellow blossoms, and very ripe yellow peaches with honey, spice and some heather. A lot going on and quite rich. On the palate it's full and rich with powerful apricot fruit laced with honey and warmth, and flows into a long, long sweet finish Very interesting, and I found it growing upon me as I sipped it. Impressive. Our first day finished with a visit to La Vis, one of Trentino's largest cooperative wineries, where we also had dinner. They boast about 1300 members, who farm about 1300 hectares of land, and while this one the one hand gives an indication of just how fragmented property ownership is in Trentino, it is for the cooperative an excellent opportunity, because they have the resources with which to harvest and vinify particularly fine vineyards as crus, and they do. 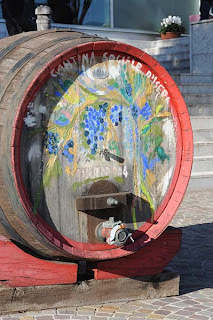 Their total production of still wines is, if I heard correctly, 4.5 million bottles per year, and they also make about 1.5 million bottles of sparkling wine under the Cesarini Sforza label. This is 85% Chardonnay and 15% Pinot Noir, from vineyards at elevations exceeding 450 meters; it spends 36 months on the lees and is brilliant brassy yellow with god reflections and fine perlage. The bouquet is fairly rich, with greenish vegetal accents mingled with white pepper and some alcohol with pleasant minerality and minty accents, and more white pepper, supported by a touch of caramel and bitter orange, as it opens. On the palate it's full, with fairly rich mineral laced lemon-grapefruit fruit supported by savory notes and some bitter minerality, with creaminess form sparkle and a fairly long citric finish with underlying bitterness. Nice depth and elegance, and quite approachable in a fairly mature key. Pale brassy yellow with bright freenish reflections and fine perlage. The bouquet is mineral with savory accents and some gunflint, some breadcrumbs, white pepper, and hints of horseradish pungency. A lot going on. On the palate it's deft and dry, with minerality and some grapefruit acidity supported by sparkle that has hints of horseradish in it, and flows into a a fairly long savory finish with citric fruit and pungency. Pleasant and has quite a bit to say. This is a Non Vintage Pinot Nero that spent 50 months on the lees. Pale salmon with fine perlage. The bouquet is dusky with minerality supported by some red berry fruit, hard wood ash, and spice; it gives an impression of austerity. On the palate it's ample, fresh, and dry, with delicate red fruit supported by mineral acidity and considerable savory accents that flow into a clean fresh savory finish. Quick to write about but graceful and will drink well with foods; it's versatile and pleasant in a tart scrappy key and though the opening is a touch softer it pulls together and tightens towards the finish. If you like this style you will enjoy it. This is from a single 1-hectare vineyard, and we were told that Nosiola was traditionally the wine of the vineyard workers, but is now being replanted with other more commercially interesting varietals -- that it is light, fresh, and easy to drink is seen as a fault by too many in the wine world who want "serious" wines. Brassy greenish gold with gold reflections. The bouquet is fresh and savory, with considerable sea salt, like a windy day on the beach, some greenish accents, and nose-tingling acidity. On the palate it's fresh, bright, and savory, with some pineapple fruit and sour pineapple acidity that flow into a fresh tart pineapple finish Pleasant, and will be very nice with simple flavorful fish dishes, and also fried dishes because of its acidity. A lark of a wine that one can drink by the bucket. This is from a single, very old organically farmed Chardonnay vineyard trained to the Pergola Trentina system at an elevation of 500 meters, on dolomitic soil. It spent 72 months on the lees. Brassy greenish gold with gold reflections and fine perlage. The bouquet is fairly rich and quite mineral, with some butterscotch, honey, some vegetal notes, slight spice, and rich opulence that is in part the vintage. On the palate it's full, soft and creamy, and quite mineral, flowing into a bright mineral finish that has almost tangerine accents. Pleasingly graceful, and though it is a bit softer than a wine from a cooler vintage would be is very nice. We drank it with a cheesy risotto, and the pairing was perfect. Pale brick ruby, the classic hue of Pinot Nero. The bouquet is brambly, with red forest fruit supported by some graphite shaving, hints sweetness (which is also alcohol), and iodine; it's quite ripe, but not overripe. On the palate it's full, with red berry fruit that's slightly jammy supported by graphite shaving bitterness and smooth tannins, with more minerality than acidity providing guidance. Pleasant in a rather ripe but not overripe key; it works well, taking Pinot Nero to the line of overripeness but not crossing it. Rather lavish, and seductive, a starlet in a glass. 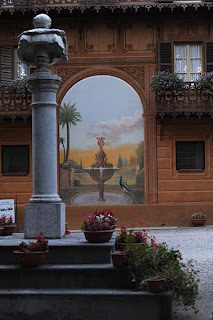 The next morning we headed south towards Rovereto, because several of our party had to take planes from Verona. 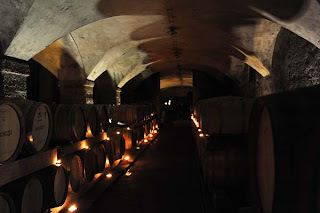 Our first stop was Balter, an old fortified Maso whose 10 hectares of vineyards are entirely surrounded by stone walls. The property has belonged to the Balter family for more than a century, and is very pretty, with stunning views up and down the Val D'Adige that are well worth the drive up -- because they are well up the flank of the valley). 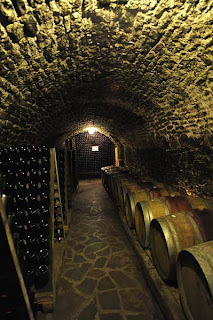 The cellars are built under the house, and extend back under the vineyard as well. I tasted the sparkling wines in Trento, and my retasting of them in the cellars confirmed the positive impressions I had in Trento. Non Vintage; it's Pinot Nero, and is pale pink with onionskin rim, and fine perlage. The bouquet is moderately intense and quite mineral, with red berry fruit and slight alcohol supported by some brambly acidity and breadcrumbs. On the palate it's fairly rich, with savory currant fruit supported by gunflint bitterness and sea salt, and also by peppery creamy accents from the sparkle, which flow into a bright savory finish with a balsamic slightly gunflint underpinning. Pleasant, and will work well with foods too; you may want a second bottle. This is a Non Vintage Chardonnay that spent 36 months on the lees. It's pale brassy gold with greenish reflections and fine perlage. Pleasant nose, with greenish vegetal accents and gunflint mingled with minerality, sage, wet breadcrumbs, and spice. Nice depth. On the palate it's bright, with pleasant minerality and lively acidity supported by peppery accents and sonsiderable creaminess from the sparkle, which flows into a clean mineral finish. Pleasant to drink, and welcoming. This is an 80-20 Chardonnay - Pinot Nero blend; it's brassy white with brassy reflections and white rim. The bouquet is fairly rich, and tart, with apple fruit supported by spice and some rosemary with underlying greenish accents, white pepper, and some butterscotch. On the palate it's pleasant, with nice minerality supporting clean tart citric acidity, while there are creamy peppery accents from the sparkle and it all flows into a clean mineral finish. Quite approachable in a slightly softer key; it's not mind-bendingly mineral, but is enjoyable. The final Balter wine we tasted is Barbanico, which has an unusual label and a bittersweet story behind it. The wine, which is a blend of Lagrein, Merlot, and Cabernet Sauvignon, draws its name from Barbara and Nicola, the current owners, whose father digging the new cellars in the mid-1990s but didn't live to see their completion. The label, which does have considerable impact, was instead done by a handicapped child, and they have some other labels that are similar. Deep cherry ruby with violet rim. The bouquet is intense, with graphite shavings and some cassis, and also cherry fruit and some jammy accents. A nice belnd, and rich in a fruit driven key. On the palate it's full, and soft, with nice cherry fruit supported by minerality and graphite bitterness, with moderate acidity and ample smooth soft tannins that flow into a clean fresh ripe cherry finish. Pleasant in a rich fruit driven key, and will work quite nicely with foods, in particular drier meats be they red or white; a fellow taster and I found ourselves thinking that it would be very nice with roast Thanksgiving turkey. It will also be a good choice if your companions at table like good things but aren't wine drinkers and wouldn't know what to make of a "Serious" wine. Our final visit was to the Cantina D'Isera, which is the smallest cooperative in Trentino; they have 220 members who confer grapes, and farm 250 hectares of vineyards located mostly around the town of Isera. brilliant brassy highlights and fine perlage. The bouquet is fairly rich, with minerality and gunflint supported by some wood smoke and some wet breadcrumbs, with struck flint and granite. On the palate it's ample, fairly creamy, and supported by pleasant savory notes and some mineral acidity. Quite dry, and will work well with foods in a fairly direct key. Non Vintage, but a 2007. It's Chardonnay, with 5.8 g residual sugars. Pale brasys yellow with brassy reflections and fine perlage. The bouquet is pleasant, with some clover and savory notes mingled with minerality and wet breadcrumbs. On the palate it's direct and up front, and fairly rich, with nice minerality and moderate acidity that flows into a clean savory finish with slight loquat accents. Pleasant in a direct, not-too-aggressive mineral key, and you will enjoy it if you like this kind of style. This is a Chardonnay, which spent 38 months on the lees, and was disgorged October 2010. They have 30 hectares of Chardonnay, and select the best to make their Riserva; which plots -- all are hillside, at elevations ranging from 350 to 750 m -- are selected depends upon the vintage. There's very little soil, and yields are low, 9-10 tons per hectare. Pale brassy green with brassy reflections and fine perlage. The nose has pleasant greenish notes with minerality and bramble, green apricot, and some spice. On the palate it's bright, and quite mineral, with nice savory notes supported by dried apricot - loqat fruit and some creaminess form sparkle, flowing into a savory mineral finish. Quite pleasant and nice integration of the sparkle too. Poured from a Magnum that spent 50 months on the lees (due to the different wine/bottle area ratio). Pale brassy gold with greenish reflections and fine perlage. The bouquet is bright, with pleasant greenish accents -- rosemary and some pine needles, slight sweetness, and some minerality with honey and clover. On the palate it's ample and creamy, with nice minerality; it's quite clean, with some peppery accents, and flows into a clean fresh finish. Quite pleasant in a delicate key -- there's no attempt to beef it up -- and quite easy to drink. This was their first Riserva, and is pale brassy gold with brassy reflections and fine perlage. The bouquet is riper, with ripe apple fruit that's slightly bruised, and some bitterness mingled with sea salt. A bit more tired. On the palate it's ample, and rather bitter, with some apple fruit flowing into a bitterer finish. It's clearly a first attempt, and doesn't reach the level of the subsequent vintages. What doesn't become bubbly becomes a fairly ordinary still Chardonnay that drinks easily but isn't really exciting. After tasting it we tasted their Marzemino, which is a different story. They have 70 hectares planted to the varietal, which is, Mr. Campestrini says, similar to Teroldeogo. Deep black cherry ruby with cherry rim. The bouquet is dusky with considerable pencil shaving bitterness and crushed cherries mingled with some spice and some underbrush. Rather pungent and quite powerful, with nice fruit. On the palate it's medium bodied, with bright cherry fruit supported by moderate acidity, bitter almonds, and graphite shaving bitterness that flows into a clean rather bitter finish with spice and greenish bell pepper notes. Quite approachable and will work well with foods, ranging from light fairly dry stews through roasted white meats. This is from vineyards planted on basaltic bedrock in areas where dolomitic cobbles come down the slopes. A distinctive terroir. Deep cherry ruby with black reflections. Interesting spicy nose with nutmeg and minerality, some berry fruit some greenness and slight animal accents. On the palate it's ample and quite smooth -- much softer structure than the Base, though there is more acidity while the tannins are warm and balsamic, flowing into a slightly balsamic finish. Quite graceful, and will drink very well with foods, especially drier meats. Deep black cherry ruby with some brick in the rim. The bouquet is lively, with berry fruit supported by ccrappy notes, spice and greenish accents supported by pleasing floral notes. Quite fresh. On the palate it's full, round, and very smooth, with fresh cherry plum fruit supported by nice acidity and by smooth tannin that have some sandalwood and spice and a pleasant touch of austerity. Quite nice, though it had just been bottled and was recovering. A fresh, fruit driven wines that will work well with a variety of foodstuffs, ranging from light stews to drier roasts or pot roasts. Nice fruit, and I would expect it to improve with time. This was the last winery visit. Below are the other wines that I tasted during the afternoon following the verticals in Trento. An aghet is an uncle, and the wine is Chardonnay. The wine is pale brassy white with brassy reflections and fine perlage. The bouquet is fairly intense, and savory, with spice and wood smoke mingled with gunflint and sea salt, with some butterscotch too. On the palate it's direct, and savory, with pleasant gunflint minerality and some peppery spice from the sparkle, flowing into a fairly long savory finish. It will work well a tutto pasto, with foods. This is 95% Chardonnay, 30% of which is barrel fermented, and 5% Pinot Nero. Pale brassy white with brilliant brassy reflections and some greenish highlights, with fine perlage. The bouquet is fairly rich, with butterscotch, some minerality, hints of gunflint, and slight caramelized bitter orange marmalade with a duskiness that brings a classic Porter (beer) to mind. On the palate it's fairly bright, with lively minerality supported by clean mineral accents and some bitterness with underlying sea salt that flows into a fairly bitter mineral finish. The palate is fairly direct, and the wine will work nicely with foods. Non Vintage; it's 90% chardonnay and 10% Pinot Nero. Pale brassy gold with greenish highlights and fine perlage. The bouquet is moderately rich, with greenish minerality supported by some butterscotch and some gunflint, with slight savory accents too. On the palate it's mineral with bitterness and some sour citric accents supported by bright peppery spice and minerality that flows into a fairly bright mineral finish with lasting warmth that gains peppery notes as fruit and minerality fade. Nice depth in a brash mineral key, and though it is aggressive, if you like the style you will enjoy it. Pale brassy white with white rim and fine perlage. The bouquet is elegant, with gunflint and some herbal notes mingled with brambles and minerality -- nice finesse and quite tight. On the palate it's deft and mineral with some gunflint bitterness and pepper from the sparkle that gains a dusky sort of warmth as the sparkle fades. Quite pleasant, and an extremely enjoyable wine to drink. This is the same wine as the pas dose, but with a little liqueur d'expedition added at disgorging. Pale brassy white with brilliant brassy reflections and fine perlage. The bouquet is elegant, with minerality and brambles mingled with greenish accents; it's slightly richer than the Nature and displays depth and elegance. On the palate it's full, rich, and considerably softer than the Nature, tough the minerality and bitterness are similar, and the sparkle adds a pleasing creaminess as it flows into a clean fresh mineral finish. Quite approachable and very pleasant to drink; the bottle will go quickly and in my notes I added, "by the bucket." Non vintage; it's pale brassy yellow with greenish reflections and ifne perlage. The bouquet is fairly intense, with gunflint and savory minerality supported by spice and bramble, with pleasing acidity and some wood smoke. On the palate it's bright, and mineral, with some sour acidity and a degree of sweetness that slows into a clean rather bitter finish. Pleasant in a more languid key; it's not as tight as some but it quite approachable and will work well as an aperitif or with foods. The chardonnay conferred minerality, while the dosage added sweetness. This is a small winery founded in 1982. Annual production is 12,000 bottles, and all are vintage. This is a 75-25 blend of Chardonnay and Pinot Nero that spends between 30 and 36 months on the lees depending upon the vintage. Pale brassy white with gold reflections and fine perlage. The bouquet is fairly intense, with gunflint and some spice mingled with minerality and bitter almond marmalade, some clover honey, and hints wet breadcrumbs. Nice dpeth and complexity. On the palate it's pleasantly creamy, with deft bittler minerl-laced sour lemon fruit that flows into a long clean creamy sour lemon finish with pleasant savrory accents. Great depth, and if you like the style, which revolves around acidity and minerality, you will enjoy it very much. Salmon with brilliant salmon reflections and fine perlage. The bouquet is fairly rich, with delicate red berry fruit supported by minerality and some pungency, slight sea salt, and some wood smoke. Nice depth. On the palate it's full and bright with moderately intense dusky mineral berry fruit that gains definition from powerful savory accents and creaminess from the sparkle -- there's more sugar than in the white to balance the tannins though the effect is discrete, not sweet -- and the wine flows into a warm small wild berry fruit finish that settles into minerality. Quite pleasant, and will drink very well with foods. Non Vintage; it's a blend of Chardonnay and Pinot Nero. Pale brassy whote with greenis reflections and fine perlage. The bouquet is fairly intrnse, with greenish brambly accents and some gunflint mingled with butterscotch, slight sea salt, and wet breadcrumbs. On the palate it's ample and fairly soft, also because of the creaminess of the sparkle, which also confers peppery accents, and bright savory minerality supported by slight sweetness that flows into a clean savory finish with underlying minerality and bitterness. Approachable, in a somewhat softer key. 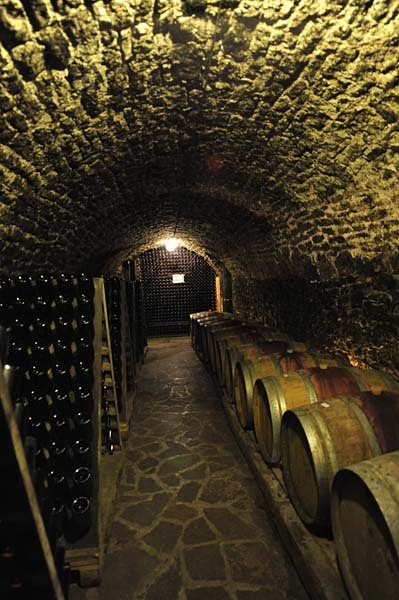 Cuvée 28 refers to the first vintages of this wine, which were kept on the lees for 28 months. With time consumers began to ask for greater richness, so they lengthened the time on the lees to 34 months. The wine is non vintage; it's a 90-10 blend of Chardonnay and Pinot Nero. Pale brassy white with greenish reflections and fine perlage. The bouquet is delicate, with some minerality and spice supported by vegetal notes, brambles, sea salt, white pepper, and some mint. On the palate it's ample and fairly direct, with moderate minerality more than fruit, and flows into a fairly sweet finish with some savory accents. It's fairly direct, and up front. Non Vintage; it's 75% Pinot Nero, 25% Chardonnay, and spent 25-28 months on the lees. Pale onionskin with fine perlage. The bouquet is moderately rich and mineral, with slight red berry fruit supported by greenish brambly accents, some chalk, and some sour notes. On the palate it's ample, soft, and fairly bright, with delicate red berry fruit supported by acidity and some creamy pepper from the sparkle, and flows into a clean fresh finish. It's up front, and quite approachable. This is 100% Chardonnay, 20% of which is barrel fermented. Pale brassy yellow with greenish highlights and fine perlage. The bouquet is moderately intense, with butterscotch and some savory notes mingled with sea breeze, gunflint, some spice, slight greenishness that brings leaf tobacco to mind, and some honey. On the palate it's ample and soft, with fairly rich, fairly sweet creamy butterscotch-laced white fruit supported by brambly accents and some pepper from the sparkle, which also confers creaminess, and it flows into a clean bright sour white berry fruit finish with lasting bitterness and some greenish accents. Quite approachable in a slightly sweeter than bone dry key, and if you like wines that are a bit softer and more voluptuous you will enjoy it. Non Vintage; the 600 on the label refers to the altitude of the vineyards. It's Chardonnay in steel, and spent 20 months on the lees. Pale brassy yellow with greenish reflections and fine perlage. The bouquet is fairly rich, with mentholated accents and spice supported by ripe grapefruit and some minerality, with underlying gunflint, hints of smoke, and dark caramelized sugar. On the palate it's bright with lively sour berry fruit and minerality supported by sparkle that confers some soft creaminess and flows into a clean fairly mineral finish. It has a brash harmonious gracefulness to it, and is also on the dry side; if you like the style, which is very much on its toes, you will enjoy it. If you prefer softer sparkling wines it won't work as well for you. This is an 85-15 Chardonnay - Pinot Nero blend; it's pale brassy greenish gold with white reflections and fine perlage. The bouquet is fairly intense, with gunflint and some smoke supported by a fair amount of bitterness and some grapefruit acidity. Quite pleasant in a more aggressive key. On the palate it's bright, with lively mineral laced white berry fruit supported by berry fruit / grapefruit acidity and sparkle that confers creaminess, and flows into a decidedly savory finish. Pleasant if you like the style, which displays considerable finesse, and revolves around savory minerality. This is a 70-30 blend of Chardonnay and Pinot Nero, and would be a Riserva if the Disciplinare allowed for rosé Riserva. Lively orangeish salmon with intriguing apricot highlights and fine perlage. The bouquet is intense and mineral, with gunflint and sea breeze supported by pungent acidity and dusky accents; there is something brooding about it. On the palate it's full and bright, with red fruit supported by minerality and hints of sweetness, with creaminess from sparkle, and it flows into a clean mineral finish. Pleasant and approachable in a fairly mineral key, though I found the nose to be more interesting that the palate. It will work well with foods. This is a 60-40 blend of Chardonnay and Pinot Nero, and is pale greenish gold with brilliant brassy reflections and fine perlage. The bouquet is moderately intense and citric with gunflint and greenish vegetal accents supported by spice and savory notes with slight bramble. On the palate it's full and bright, with mineral alced acidity some some vegetal notes, though it's mostly minerality flowing into a clean bright mineral finish. Pleasant, in a deft mineral key, and something to think about if you like this style. This is a 50-50 blend of Chardonnay and Pinot Nero; it's called 976 because Leonello Letrari opened one of his properties that year. Pale grassy yellow with brassy reflections and fine perlage. The bouquet is deft with minerality and some red berry fruit supported by breadcrumbs, savory accents, and some sea breeze. Quite deft, and further sniffing brings up slight menthol and vegetal accents. On the palate it's bright, with lively minerality and savory fruit, some citric accents, and a clean mineral finish that gains definition from the sparkle and form lively citric acidity. Pleasant and has quite a bit to say; there's a touch of sweetness to it, but it's balanced by the acidity, and it is quite pleasant in a decidedly mineral key. 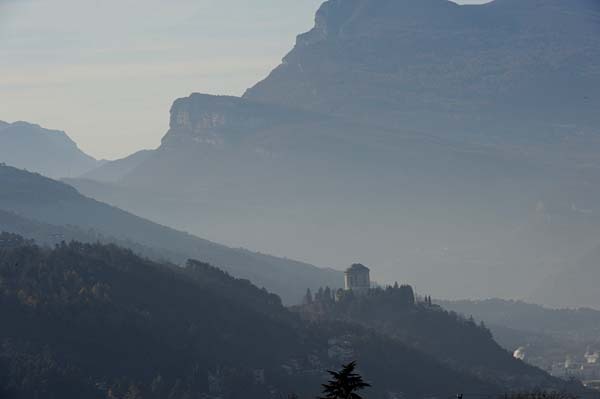 They are located between Trento and Lake Garda. The wien is 100% Chardonnay and is pale brassy yellow with golden reflections and fine perlage. The bouquet is moderately intense with minerality and some greenish accents with underlying gunflint and spice. On the palate it's fairly rich, with minerality and some white berry fruit supported by clean savory accents that flow into a fairly tart citric laced finish. Up front and pleasant to drink; there's pleasant acidity on the palate that carries through into the finish. Non Vintage; it's pale brassy yellow with fine perlage. The bouquet is greenish, with considerable minerality and some spice, clover, gunflint and hints of chalk. On the palate it's ample, creamy, and fairly sweet, with bright citric fruit supported by creamy acidity and soft sparkle that flow into a warm lemony finish with mineral accents as it fades. If you like the softer style it's quite approachable. Pale brassy gold with golden reflections and fine perlage. The bouquet is fairly intense, and herbal with vegetal notes, grass, some citric accents, breadcrumbs, and some minerality and menthol. On the palate it's ample and creamy, with citric laced minerality and some gunflint bitterness that flow into a clean fresh mineral finish with savory accents and some sour lemon acidity. Approachable in a fairly brash key, and will be a versatile accompaniment to foods too. Non Vintage; it's pale brassy yellow with brassy reflections and fine perlage. The bouquet is moderately intense with some vegetal notes and lemony fruit supported by greenish accents, some gunflint, and slight tartness. On the palate it's ample and soft, with the sparkle providing creaminess while there is some minerality, and more clean bright citric acidity. Pleasant and approachable in a scrappy key, and will drink well as an aperitif or with foods. 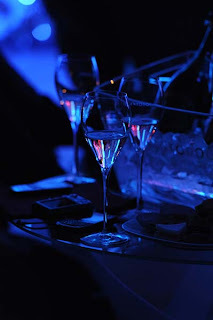 If you prefer smoother softer sparkling wines it won't work as well for you.